It is true that most of us give the proper attention to it only after a big loss. I’m talking about the leader, the line that combines our jig to our braid. The leader is a very critical part of our set and we should give plenty attention when it comes to choose the right line. But let’s start from beginning and take things one by one! This might seem as an easy answer but believe me it is not. First of all I have to admit that I use only Fluorocarbon leaders. Why? Not because it is suppose to be invisible in the water. 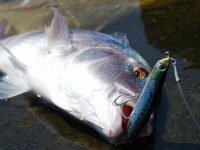 The jigs move so fast that fish do not have enough time to observe it. I choose Fluorocarbon leaders because they can stand a hit on the rocks. Nylon lines are more susceptible to scratches but they give powerful knots and because of their elasticity they give better action to the jigs and their price is much lower. I have to mention that there are some very specialized nylon mono leaders for tunas that are made by very hard copolymer mixtures in order to stand extreme friction by the tail of the running tuna, but this is another story. 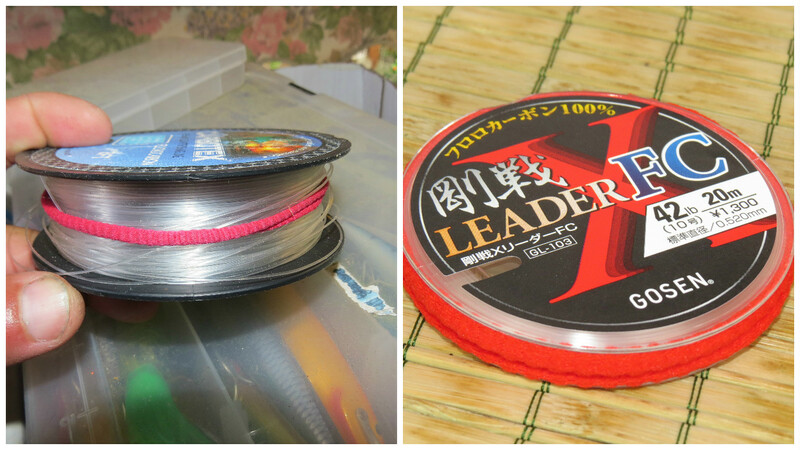 In my opinion a good fluorocarbon leader is more than enough to cover your needs! Different qualities of Fluorocarbon is a “must have” to meet our needs depending the place! Here we go again with the same advantages and disadvantages like the FC – nylon comparison. In our days, technology has made huge steps in Fluorocarbon industry and is able to produce FC qualities with different characteristics. So yes we can have even softer qualities of FC. Soft Fluorocarbon leaders give excellent movement to the jig, they have less memory (a real disadvantage of FC), absorb tense during a strong fight and produce better knots. But on the same time they get more vulnerable to rocks and friction. On the other hand, hard Fluorocarbon leaders tend to affect the perfect action of the jig, the knots must be made and tested thoroughly and they have a lot of memory. This memory “remembers” the coils of the spool and between jigging, the leader tries to coil again and again and this makes a hell of a noise, not to mention that it acts like a drag system to the jigs action. In contradiction a hard Fluorocarbon line is very resistant to friction and to the contact with rocks. Even if it gets damaged a lot, it still might be able to land the fish. Personally in lighter types of shore jigging up to 60gr jigs, I use softer qualities of Fluorocarbon lines and after that to as high as 150gr I use the harder types I can get. 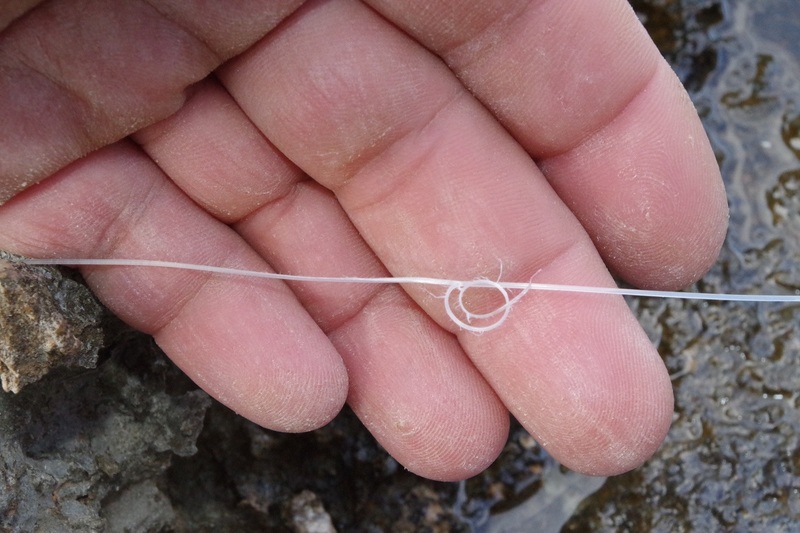 Typical damage on a hard type fluorocarbon from a running fish to the rocks. The line get damaged but eventually it landed the fish. Shorter or longer is another question that many of you tend to ask me. The answer still has to do with the place that you fish and the species that you are after. I know, there is no contract with what fish might attack your jig, but for sure we are always targeting on something. At least I do. 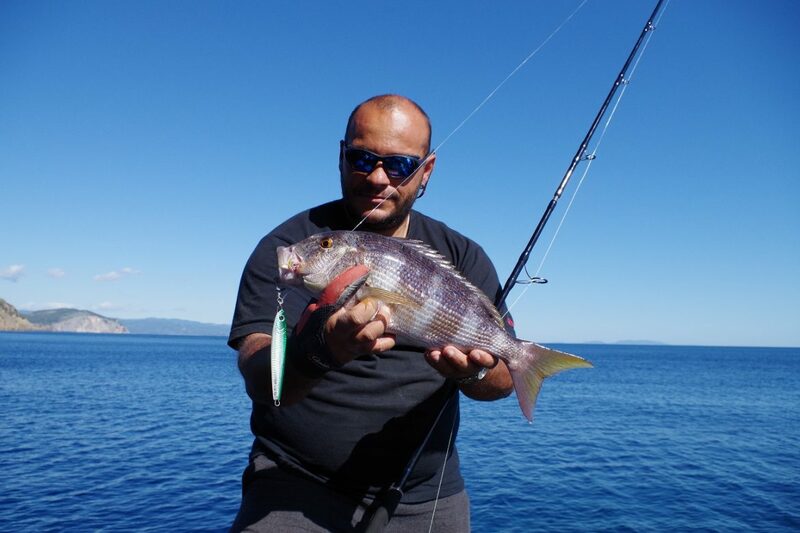 So for example on rocky places and especially for species like snappers, groupers and amberjacks, I use leader that sometimes goes up to 3 meters because I want to keep my braid as far as possible from the rocks and I let the tough fluorocarbon do all the hard work. Before you ask, I answer that yes the knot comes into the guides and sometimes as deep as the half of the rods length. And no, I do not have any issues with casting and all those years never had a damage to my guide rings. But the longer your leader is, the more it affects your jig. Shorter leader allows the jig to “dance” better while falling and does not affect much its action. I use shorter leader when I’m targeting pelagic species like bonitos, albacores, bluefish, leer fish and dorado because those fighters do not run to the rocks to break the line. As you can see to this point, fluorocarbon leader is a very critical part on our set up and we must have different qualities of it, in order to fit them to our needs. I suggest to tie the leader on the place of fishing to make sure it won’t get damaged during transportation or when you go somewhere for the first time. If you are visiting a place that you know well then you can have it ready from home but be very careful not to damage it during transportation. Finally to answer to some of you the question that comes unexpectedly often, if you can bypass the use of leader and tie the jig right on the braid, the answer is NO! For a better understanding of the long leader to very rocky bottoms just go to the video below and run to 3:45 minute! Then you will know what I’m talking about! 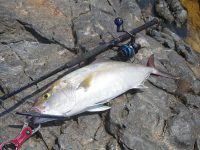 Spinning: Single hooks VS treble hooks: The great dilemma!